MADRID (AP) -- It may not be the most suitable exhibit for the squeamish but the Prado Museum’s 500th anniversary display of the most and best of Dutch Renaissance master Hieronymus Bosch is definitely a must for art lovers, and maybe gore freaks too. Bosch’s work, with its monstrous, apocalyptic scenes depicting man’s struggle against temptation juxtaposed with idyllic scenes of paradise, has long fascinated art lovers. But rarely has so much of his work been brought together under one roof. The Prado says the show is unique and most likely unrepeatable. 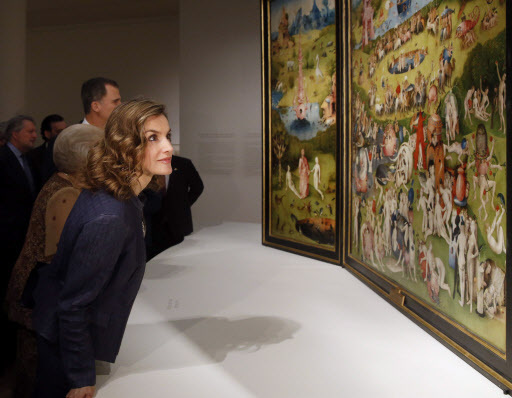 The exhibition inaugurated Monday centers on his triptychs, most notably “The Garden of Earthly Delights,” “The Haywain,” both from the Prado and “The Temptations of Saint Anthony” from Lisbon’s Ancient Art National Museum. In all, it features about 50 works, including 29 Bosch paintings and drawings that the Prado said constitutes 75 percent of his surviving works. Around 20 museums in Europe and the U.S. contributed to the show. King Felipe VI opened the exhibition with former Dutch queen, Princess Beatrix. Religious themes dominate Bosch’s work but his fame stems mainly from the fantastically bizarre landscapes and scenes he painted that are populated with surreal flying demons, fish-headed human figures, walking heads in all sorts of grotesque and indecipherable activities. Dazzling in detail and slightly unnerving, they leave few spectators unmoved. Prado conservation specialist, Miguel Falomir said evidence of this was that the Bosch rooms were the museum’s most visited and where most people stayed longest. Bosch, or “El Bosco” as he is known in Spain was born Hieronymus van Aken in 1450 in the town of Hertogenbosch, Netherlands, from which he takes his name. The Prado show follows a similar one in the Dutch town earlier this year, but which lacked several key works. Spain, and in particular the Prado, possess the lion’s share of Bosch’s existing works owing chiefly to Felipe’s medieval predecessor King Felipe II, who was an avid art collector. The show runs until Sept. 11.